Beck is laughing at critics who are making a big deal over his 'lie.' at last weekend's rally. 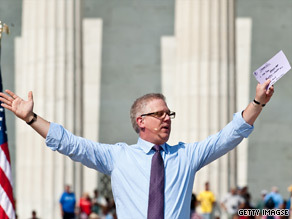 (CNN) -Glenn Beck is scoffing at recent attacks from MSNBC's Keith Olbermann and others after the Fox News host inaccurately told the crowd at his recent Washington, DC rally that he "held" George Washington's handwritten inaugural address. "I thought it would be a little easier in the speech," Beck told his radio listeners Thursday as he dismissed the most recent liberal attack directed at him. The uproar from the left came in response to a comment Beck made during his Restoring Honor rally on the National Mall last weekend in which he said, "I went to the National Archives and held the First Inaugural Address written in his own hand by George Washington." Turns out the Archives' policy doesn't allow members of the public to touch rare documents like the First Inaugural Address. Instead, Beck was permitted to view the document through plastic – prompting Olbermann to declare "his story that he actually got to hold it…is wrong." "His fib stands in stark contrast to the point of the rally, which was all about restoring the principles of courage and honor that the nation was founded upon," the publication Mother Jones chimed in. But Beck himself didn't seem frazzled by the allegations. "They are like, 'He's such a liar. Glenn Beck is such a lair!' said Beck laughing off the criticism. "I thought I'd be a little easier than to say, 'Yesterday, I went to the National Archives, and they opened up the vault, and they put on their gloves, and then they put it on a tray, and they wheeled it over, and it's all in this hard plastic, and the because you're sitting down at a table and you can't – because of [Former National Security Advisor] Sandy Berger - you can't actually touch any of the documents because they are very rare'…..I thought it was a little clumsy to explain it that way." "Might have been a little too much useless information!" Beck exclaimed. "Once again, they caught me." Followers of the Beckler – the self-proclaimed King of Bizzaro world – get offended?? What a joke, Beckler is the king of offensive jibberish and childish conspiracy theories. Beck lies and changes position everytime he has a clean blackboard to scribble on. Yes, minions of the lizard brain – we can use that simple little website U-Tube and catch the Beckler in every one of his many lies and deceptions. But only if you care to follow all the jibberish that he spews out, but who has the stomach for that?? I've tried to watch his "show", but my gag reflex gets so bad I throw-up in my mouth. I don't need to watch him on foxed up TV, small doses on comedy central does just fine. Jon doesn't have the magic undies, or the crocidile tears, but he's clever and better looking. I am puzzeled as to why this story was printed. Glenn Beck claimed to do something no one is allowed to do. That isn't news, or new, nor exclusive to Glenn Beck. Most people do it. What does puzzel me is why people argue about it. Lieing in the media is as commonplace as lieing in politics. And lets face it, the public don't really want to hear the truth. they actually want to be lied to. The public want to hear what they themselves believe. It's why certain people follow certain media outlets. And it's also why those media outlets label the followers either on the "left" or on the "right", conservative or liberal. The media claim to be speaking for the people when in reality what they are doing is pandering. It's all about money these days. the media will say whatever gives them ratings and who cares about the truth. No one wants it, no one will believe it and no one even cares anymore. It's easier to blame others then it is to take responsability for your actions. For all the rhetoric about values, the only value anyone truely cares about anymore is the valus of the dollar. How dare he? What a disgrace! I am looking forward so much for Obama, Pelosi, Reid, Rangle, Frank, and Biden to speak the truth. A certain place will freeze over before those aforementioned clowns will speak the truth. You go to hell for lying is what i was always told. Come on you guys! Keith Olberdork is the first human being born without a brain. I have to believe his heart is missing too as he is so full of hate and vitriol. Poor man. He is genuinely a lost soul. What's the fuss about this lie he told, it's so insignifigant next to all the others he tells, everytime he opens his mouth.